I participated in MOPS for the first time this past year. MOPS stands for Mothers of Pre-Schoolers. It is a Christian based group that meets every other week during the school year. While our children were being cared for by loving volunteers, we moms ate delicious food, listened to presenters, and discussed mother-related themes in an environment filled with support and inspiration. 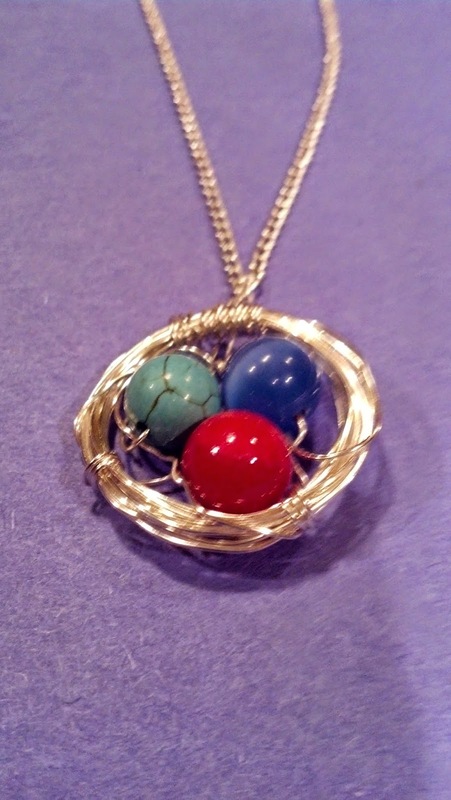 For our last session of the year we did an arts and crafts project: making a bird’s nest necklace out of beads and wire. When the volunteers brought our kids into the gathering space at the end of the session, my four-year-old daughter Jocelyn immediately began examining my necklace. A big smile broke across her face when I told her that she was the turquoise bead in the nest. She then began rapid firing questions at me: Which bead was Zack? Which bead was Mason? She caught me off guard a bit when she asked me where I was. I fumbled for a minute, and then said that I was the nest surrounding the three beads. When she asked me where Daddy was, again I scrambled, and said that he was the chain. As I drove home, I kept thinking about my necklace and how rich and deep the symbolism goes. The different colored beads represent how uniquely different my three kids are, yet all are just as fragile as the paper-thin eggs they represent. Each child has his/her own beauty, but like the beads, none of them is perfect. They each have their individual challenges to overcome, lessons to be learned, before they become their true selves. I am so grateful that my daughter forced me to define my husband’s role. As a stay-at-home mom, I sometimes get so bogged down in homework, taxi rides, and laundry that I don’t recognize my husband’s efforts to keep us all afloat financially, physically, and emotionally. Without a chain, my nest would have nothing to hang from. My life would be less stable, less love filled. I am also grateful that I now have a visual reminder of my role: the responsibility I have to always maintain a safe and nurturing place for my kids to land, to be themselves, learn, and grow. When something inside my kids hasn’t hatched yet, I need to be patient, warm and gentle. If I’m not, if I’m jarring and demanding, I will inadvertently crack their shells, their fragile egos, in the most delicate places. And as unpleasant as the idea is that a mama bird eats food, breaks it down, and then regurgitates it into the mouths of her baby birds, the metaphor is there for my role as my kids’ mom: to ingest everything they need to know about life and their faith, break it down into small bits that they can comprehend, and feed it to them slowly, consistently, with repetition, ad infinitum. As I thought more about my daughter’s questions, I heard a voice in my heart ask, “Where is God?” As a mom who is trying so hard to weave God into every aspect of my motherhood, it is obvious to me that God is the wire. He is what my nest is created from. He is the one who gifted me with these beautiful children. It is His love that runs through each one of them, connecting them to each other, and to me. He is what anchors us to my husband, and to all that is good in our lives. The necklace is a wonderful reminder that these little birds are only mine for a short while. I need to rely on His guidance to equip them for success before they fly away. When they do take flight, it will be through His grace that they soar! You got me a bit teary here…so beautiful.